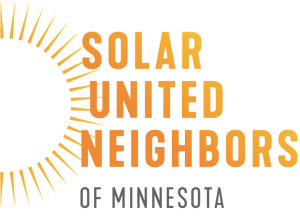 Welcome to Solar United Neighbors of Minnesota! I am Virginia Rutter, Solar United Neighbors of Minnesota’s Program Director. I am so excited to begin working all across our great state to educate Minnesotans about the benefits of distributed renewable energy, help them go solar, and strengthen our community of solar supporters. Solar United Neighbors of Minnesota is the newest program of Solar United Neighbors, a community of people building a new energy system with rooftop solar as the cornerstone. We help people go solar, join together, and fight for their energy rights. Solar United Neighbors works locally to help people go solar. We work with partners to develop solar co-ops. These co-ops bring communities of neighbors together in a bulk purchase to make it easy for members to save on solar. Solar United Neighbors works with co-op members so they understand solar technology, solar financing, and the process to install panels on their homes. Co-op members work with Solar United Neighbors to issue a request for proposals from area installers. Co-op members then select the bid that best meets the needs of the group. Solar United Neighbors provides installer-neutral advice through this selection process. The chosen installer then develops personalized proposals for each co-op member. Members review this proposal and decide if they want to go solar. Solar United Neighbors has helped more than 2,300 homes install solar through this co-op model. This year, Solar United Neighbors launched a membership program to provide support to individuals interested in solar. Members have access a dedicated help desk to get the support they need to go solar when and where they want, on their own schedule. Solar United Neighbors members continue to receive support long after installation. Through the Solar Help Desk, newsletters, meetings, and events, members get answers to questions regarding their system’s performance and receive help understanding emerging technologies and new incentives. Membership welcomes people into a community where they can meet, learn, and have fun with other solar supporters while working to transform America’s energy system. Before joining Solar United Neighbors, I worked in clean energy finance consulting. I helped a variety of local governmental and nonprofit clients to navigate the community solar subscription process, understand the regulatory process, and develop small to medium-sized energy efficiency and solar PV projects on their properties. I am looking forward to leveraging this expertise at the residential level! In the next few months, I will begin conversations with communities throughout the state to find the best locations for our first co-ops. If you know of a great location or want to partner with us, please let me know!